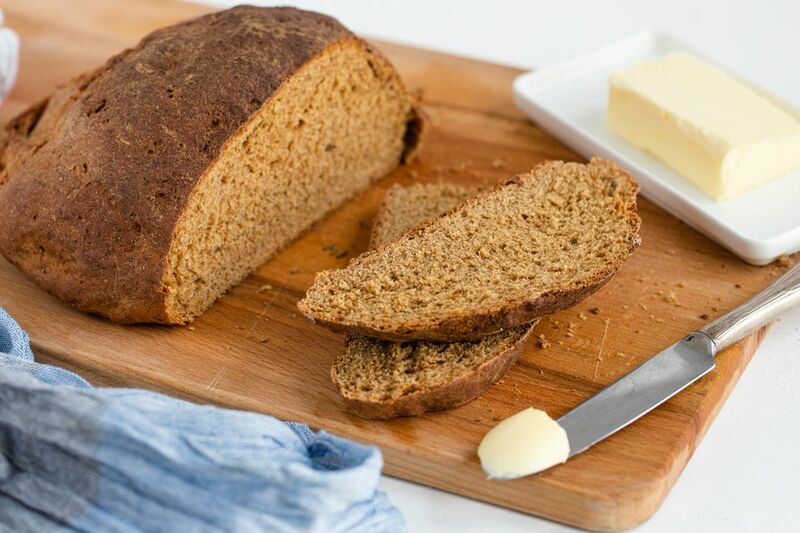 Pumpernickel bread is easy to make and it costs less than the store-bought pumpernickel bread. What’s more, home-baked bread tastes better and is healthier for you. This recipe makes two small, round loaves of pumpernickel bread. You can also use this recipe to make braided rolls. In a large bowl, add the warm water and yeast. Stir mixture until the yeast is dissolved. Stir in the molasses, salt, shortening, caraway seed, and rye flour. Mix in 2 cups of bread flour. Slowly add the remaining bread flour until you have a dough that can be kneaded. You may or may not use the full amount of bread flour that is called for, depending on your ingredients and the weather. Turn the dough out onto a floured board and knead for about 5 minutes. If the dough is too sticky, knead in more bread flour, a tablespoon at a time. Place the dough in a greased bowl. Flip the dough over so that top is also lightly greased. Cover the bowl with a clean kitchen towel or plastic wrap and let the dough rise in warm, draft-free place for about an hour or until it has doubled in size. Cover it again and let it rise for another 45 minutes. Punch down the dough a second time. Turn out onto a lightly floured board or surface and knead the dough briefly. Grease a baking sheet. Sprinkle the sheet with cornmeal (optional). Cut the dough in half. Shape each half into a small, round loaf. Place both round loaves on the baking sheet. Cover and let the dough rise for about 45 minutes or until doubled in size. Bake loaves at 375 F for 35 minutes or until the bread sounds hollow when tapped on. Remove the loaves from the oven and let them cool on a rack. Once cooled, store your loaves in a plastic bag to keep the bread soft. The loaves can be wrapped in plastic and frozen. When ready to serve, you can toast the bread lightly and pair with butter or jam for breakfast, or as a side with your dinner. Use bottled water instead of tap water to make your breads. The yeast can be killed by too much chlorine as may be found in some tap water, which will keep your dough from rising. You can also boil and cool tap water to eliminate most of the chlorine.